Eric Primm is an engineer for the Boeing Company and a fiction writer in the University of Missouri – St. Louis MFA program. Architrave is his first publication. 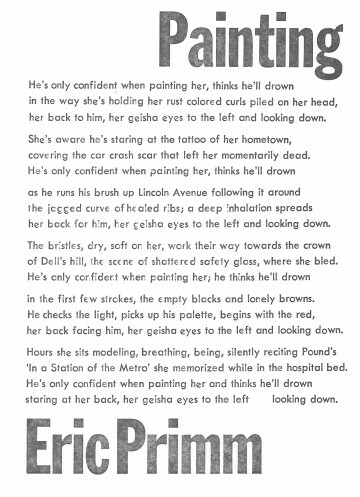 The restrained longing expressed in this poem is well suited to the Villanelle, its pattern of repeated lines and end rhymes creating an obsessive focus on the woman being painted. She’s naked enough for the speaker to see the scar across her ribs, but she remains distant, even as she intoxicates him. It’s all so seamless in Primm’s hands, how the brush is both on the woman’s body and the canvas, how she is both present and absent, but it’s actually quite difficult to do. Most Villanelles fail because the writer contorts the language to fit the form, making something so obviously artificial it fails to satisfy. Not here. The phrases slide through the repetition just as someone would say them today. It ends, as required, with the repeated lines, sealing this couple into a kind of permanent non-embrace. It’s form beautifully following function. The woman’s scar and tattoo are both remnants of the deeper wound: the car crash that nearly killed her. It’s the kind of event that makes headlines. News Gothic provides a reminder of her trauma and a contrast to the silence between painter and model. It’s also very big, so the letterpress ink spreads out and looks more like watercolor. Futura’s clean curves suggest the contours of her body. The woman never meets the painter’s gaze, and so the lowercase Gil Sands ‘e’ provides a dropped, slightly off look to all of “her” words. *Old lead type can sometimes be difficult to identify. Even the letterpress gurus at All Along Press didn’t know for sure; this is our best guess.